Discovered in 1772, nitrogen constitutes some 78 percent of the earth’s atmosphere—four times that of oxygen—and is an essential component of amino acids, proteins, and nucleic acids. Through a series of mutually beneficial interrelationships, nitrogen in decomposing plant and animal material is made available as a soluble plant nutrient and then converted to a gaseous form and returned to the atmosphere. That nitrogen must be reduced (fixed before use) by plants or animals was determined by the French agricultural chemist Jean-Baptiste Boussingault. From 1834 to 1876, at his farm in Alsace, France, he established the world’s first agricultural research station, applying chemical experimental methods to the fields. Boussingault also determined the nature of nitrogen’s movement between plants, animals, and the physical environment, and studied such related problems as soil fertilization, crop rotation, plant and soil fixation of nitrogen, ammonia in rainwater, and nitrification. In 1837, Boussingault disproved the general belief that plants absorbed nitrogen directly from the atmosphere and showed that they did so from the soil as nitrates. The following year, he discovered that nitrogen was essential for both plants and animals, and that both herbivores and carnivores obtain their nitrogen from plants. His chemical findings laid the foundation for our current understanding of the nitrogen cycle. In 1888, the German agricultural chemist Hermann Hellriegel and the Dutch botanist and microbiologist Martinus Beijerinck independently discovered the mechanism by which leguminous plants utilize atmospheric nitrogen (N2) and soil microbes convert it to ammonia (NH3), nitrates (NO3), and nitrites (NO2). Symbiotic (mutualistic) nitrogen-fixing bacteria, such as Rhizobium, acting in plants of the legume family—including soybeans, alfalfa, kudzu, peas, beans, and peanuts—enter the root hairs of the root system of the plant, multiply, and stimulate the formation of root nodules. Within the nodules, the bacteria convert nitrogen to nitrates, which are utilized for growth by the legumes. When the plant dies, the fixed nitrogen is released, making it available for use by other plants, and thereby fertilizing the soil. SEE ALSO: Prokaryotes (c. 3.9 Billion BCE), Land Plants (c. 450 Million BCE), Agriculture (c, 10,000 BCE), Plant Nutrition (1840), Ecological Interactions (1859). 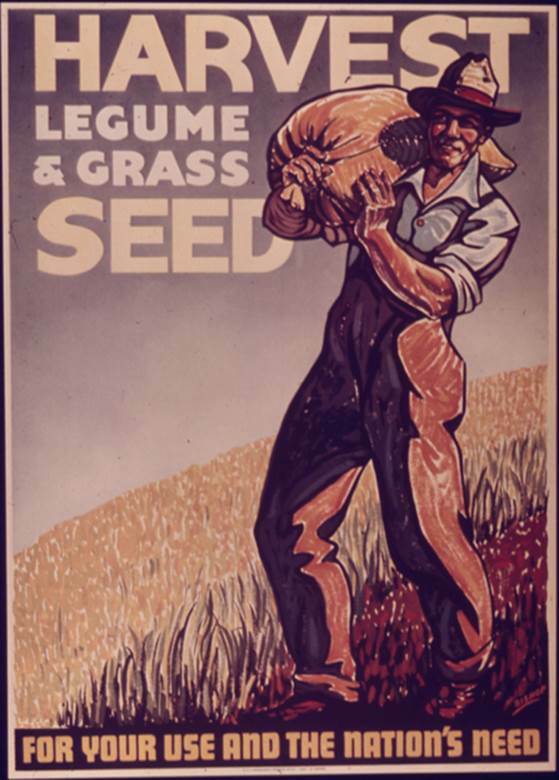 This World War II poster promotes the harvesting of legumes, which provide a food source and utilize atmospheric nitrogen to fertilize the soil.